I heard a rumor that Pearl Mackie (Bill Potts) isn't coming back susunod season. What happened? These are my "unpopular opinions" (idea credited to Trailer patong lalaki on YouTube) about Doctor Who 2005. Now, these might be controversial so PLEASE be respectful in the comments! Michelle Gomez is a FAR better Master than John Simm. Simm was fine, but he was too over the tuktok for me to properly enjoy. The Weeping mga kerubin are not that scary. They’re creepy, sometimes startling as well as being creative monsters and I’m glad they exist but they aren’t terrifying to me as they are to a lot of other people. Doctor Who has a wide range of characters. From villains, monsters, Doctor's, Master's, companions and extras, there's a wide range of men, women, homosexuals, heterosexuals, bisexuals and asexual's in this ipakita and the expanded universe. As he sits at tahanan all he can think about is Rose and how he left her behind.He thinks of all the good times they had together. His eyes burned as he watched another episode of their video diaries. It hurt him to just look at a litrato of Rose. "I hope she is happy with where she is right now but I know she is sad. I miss her. I wonder if she missies me too?" She meant so much to the Doctor. She was his araw and his night,she was the burning pag-ibig in his heart. Just the thought of Rose mead the Doctor sad. The tears in her eyes are real tears, and still she waits for him to come back. She waits for her pag-ibig and still just her and the wind on this lonely beach. The tears in her eyes threatening to spill on to her cold cheeks as she took a deep breath. You could see the pain in her eyes as she stood and looked right back into his eyes and could see the same amount of pain and maybe even more. Two minutos to tell him I pag-ibig him just as I should have long before we ended up here. 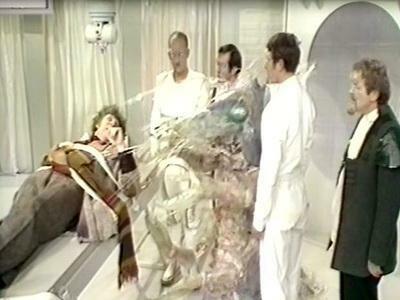 From which Tom Baker episode is this screencap?